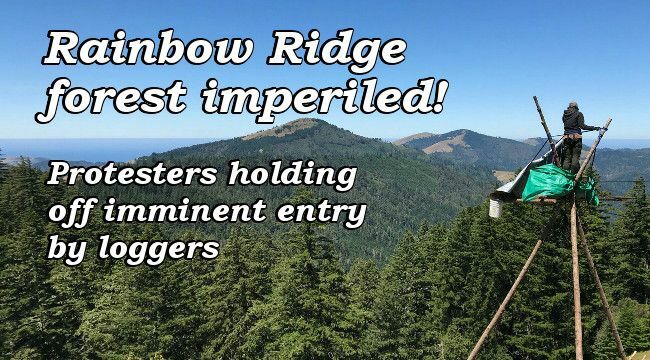 Update July 23, 2018: On Sunday, July 22, 2018, at about 5 a.m. employees of Lear Asset Management, a security contractor for Humboldt Redwood Co. (HRC), swept down on protesters camped near a logging road on Rainbow Ridge in the Mattole River watershed. With tasers drawn the guards forcibly restrained two non-resisting protesters, placing them under citizens arrest and confiscating personal equipment including solar panels and a camera. The guards contacted the Humboldt County Sheriff's Dept., which arrived on the scene about 8 a.m. and took custody of the arrestees, who were later booked and released with pending court dates. Update Aug. 7, 2018: Since then Lear Asset Management paramilitary security have dismantled the tripod. Dozens of the people have protested at the main gate into the area and contacted HRC CEO Sandy Dean, urging him to call off law enforcement and work with local citizens to protect the area. Your emails and calls are still needed! The largest unprotected ancient Douglas-fir forests in California could be cut down at any time. Your calls and emails are needed immediately to save these irreplaceable primary forest stands, which have never been entered by industrial logging. Security guards employed by Humboldt Redwood Co. (HRC) on July 3 paid a visit to a protester camp blocking a company logging road about 30 miles south of Eureka, Calif. The security guards told the protesters that the company was considering calling in Humboldt County sheriff's deputies to break up the protest and make arrests. If this took place it would be a major milestone—the first intervention by law enforcement in many years in the now decades-old fight to save storied Rainbow Ridge, an 18,000-acre tract with over 1100 acres of ancient Douglas-fir and hardwoods, as well as natural coastal prairies and forestland previously lightly logged but still largely intact and irreplaceable as habitat. Phone or email now to save Rainbow Ridge! The area is located in California's remote Lost Coast region, earthquake capital of the continental U.S., where industrial timber operations such as those undertaken by HRC can be especially damaging due to the area's highly unstable soils and steep, landslide-prone terrain. The protesters have set up a tripod on the road leading into the key Long Ridge and Long Reach timber harvest plan areas. The logging season began recently, so the protesters represent the only current impediment to logging trucks and crews moving in to begin felling trees. Rainbow Ridge is vital habitat for rare and endangered species such as the Pacific fisher, Coho salmon, Northern goshawk, Golden eagle and Northern spotted owl, as well as a large and distinctive type of old-growth-dependent medicinal fungus, the agarikon. Your calls and emails are needed today to save Rainbow Ridge!